It’s Museums at Night across the UK so we are having a film show. 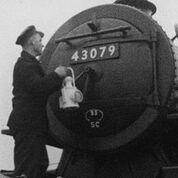 To mark the 70th anniversary of British Railways we’re hosting a screening of newly digitised rare archive films, curated by the Independent Cinema Office, charting the history of railways in the UK, their romance and heady freedom in the early twentieth century. The Joseph Wright Hall is wheelchair accessible on the ground floor only. The first floor auditorium is accessible by stairs or a stair lift. There are wheelchair accessible toilets.